The Jim Corbett National park is established as a Hailey National Park in 1936. It is one of the oldest parks in the country. The park is popular as the first tiger project as it holds a large number of tigers. It is a home place for more than 650 rare species. The park was named after the famous hunter of tigers Jim Corbett. This park is located in the Uttarakhand, India. It is one of the best places to enjoy the wildlife in India. It is one of the oldest and first national parks in India. It is the first project which aims to conserve the Indian tigers. It has a wet land, grassland, sloppy hills, lakes and many other things. The park covers 520 square kilometers of area. The tourists from all around the country visit this park. They can enjoy many adventure things in the park. 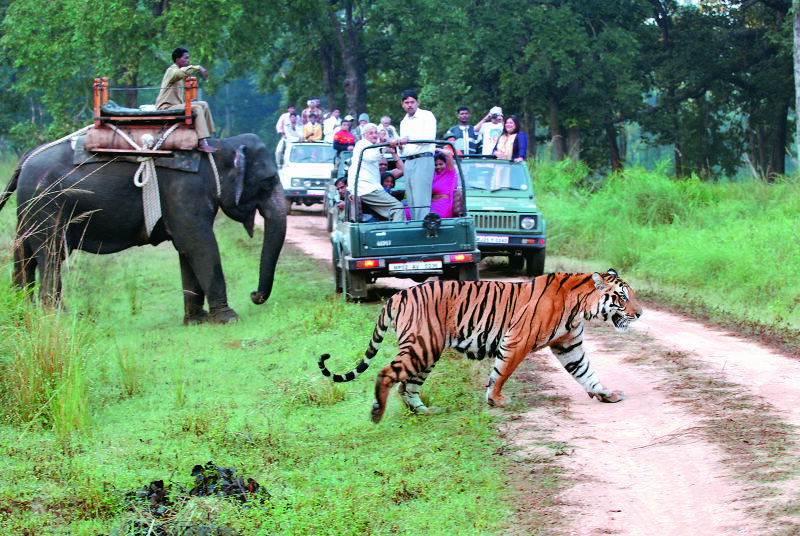 One of the best things is the wildlife safari in the Corbett national park. There are many options for safari including jeep, elephant and canter safari. The elephant safari offers a great fun of Safari. It starts from the gate of Durga Devi and ends at the Halduparao. It charges Rs 500 from the Indian and Rs 1500 from the foreigner. It allowed 4 persons at a time. The jeep safari is the fastest and comfortable safari. It charges Rs 3600 from the Indian and Rs 7000 from the Foreigner. It allows 6 persons at a time. The Canter safari is the best option for those who want to explore the Dhikala forest. It allows 16 persons at a time. It charges Rs 1500 from the Indian and Rs 3000 from the Foreigner. The best time for the safari is morning from 6 am to 11:30 am and evening12 pm to 5:30 pm. There are many other spots for the tourists to enjoy. On the bank of Koshi river, there is the temple of Garjiya Devi. It is visited by many visitors during Kartik Purnima. For bird lovers, the best spot is Sitabani Forest Reserve. It has millions of bird to watch. It is the resting place for the goodness Sita. There is a Corbett museum in the park, which was the home of Mr. Jim Corbett. On the entrance of the park, it has Dhangari Museum. The park also has a Corbett waterfall. It is the best place for enjoying the peaceful nature and for camping. The tourists can also visit the highest peak in the park to enjoy the sunrise. It is the best point to view the scenic beauty of rivers Kosi and Ramganga and around the area. The best time to visit this park is from November to June. The nearby city to this park is Ram Nagar. The tourists can visit this place by bus and train.